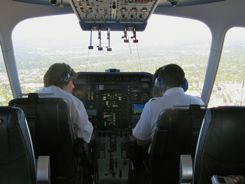 Bird's eye view through the cockpit windows. Where can you do this anymore? Bird's eye view front AND rear. Here's a recent "trip", and we didn't even travel far from home! We had a chance to fly in a Zeppelin airship. Believe me, this experience was a "trip"! This was actually part of a romantic weekend, celebrating a wedding anniversary. If you're looking for a different sort of romantic weekend, you might want to consider this. 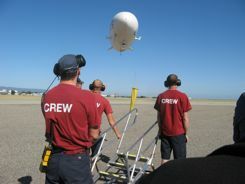 For those of you who are into aviation, this is not a blimp... it's a dirigible. And it's made by the Zeppelin company in Germany. As of this writing there are only three flying in the world... one in Germany, one in Japan, and one in California. The one in California is the easiest to get a ride on. 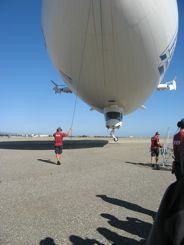 If you think you might want to fly in a Zeppelin, just contact Airship Ventures. 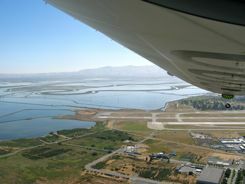 They are based at Moffett Field, California. That's in Mountain View, south of San Francisco and just north of San Jose. We wrote more about our flight in the Zepplin Eureka on our Antique Airplanes website. Whether you travel to ride in it or not... it's a trip you won't forget.